Cable television pioneers Alan Harmon and Bill Daniels were awarded a USFL franchise for San Diego when the league announced its formation in 1982. However, the city refused to grant the team a lease to play at Jack Murphy Stadium under pressure from the stadium’s existing tenants—baseball’s Padres, the NFL’s Chargers, and the NASL’s Sockers. The only other outdoor facility available in the area was Balboa Stadium, the original home of the Chargers. However, it was a relatively antiquated facility (built in 1915) that had not had a major tenant since the Chargers moved into Jack Murphy in 1967, and was now largely used by high school teams. This was an untenable situation for a team that was aspiring to be part of a major sports league. 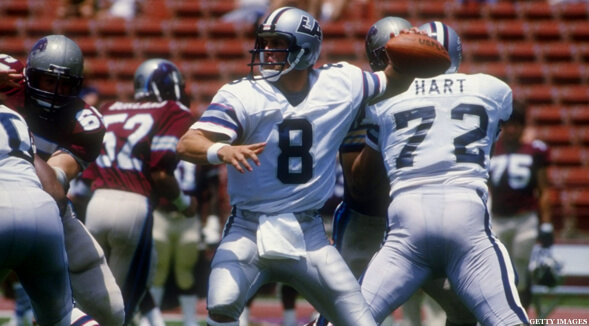 With only eight months before the season was to start, Harmon and Daniels decided to move to Los Angeles with the league’s blessing—in the process, forcing Jim Joseph, second owner of the Los Angeles USFL franchise, to move his team. Joseph relocated his franchise to Phoenix, Arizona, as the Arizona Wranglers. Then, just as quickly as the Express rose, they fell. Midway through the season, the FBI began investigating Oldenburg’s financial dealings. Multiple exposés by The Wall Street Journal and The New York Times revealed Oldenburg not only had a habit of luring savings and loans into questionable deals, but was also nowhere near as well off as he had long claimed. It turned out that the USFL was so determined to get a solid owner in Los Angeles that it didn’t conduct any meaningful due diligence on Oldenburg’s application. While Oldenburg had gained a reputation as the enfant terrible of the league, no one even suspected that he was a fraud until the investigation revealed that he had virtually no money. It appeared that he was only able to appear to have enough net worth to buy the team by buying a piece of property for a discount, then selling it to a small bank that he owned for ten times its actual worth. As bad as the situation with the Blitz had been for the league in 1984, the Express were even worse in 1985. Not only did the Express’ roster costs dwarf Chicago’s due to the large contracts, but the league had contracted in the off-season and there were only 13 other teams to contribute to supporting the Express. In what proved to be a harbinger of things to come, the team was evicted from its hotel during training camp after the bill went unpaid. The players were forced to room with each other for the remainder of camp. They also went without water for much of camp after a $136 bill went unpaid. A bank won an attachment on the franchise as part of a lawsuit against Oldenburg after he defaulted on a loan. However, the attachment was withdrawn when bank officials learned they would be responsible for $1.3 million in player salaries that week. 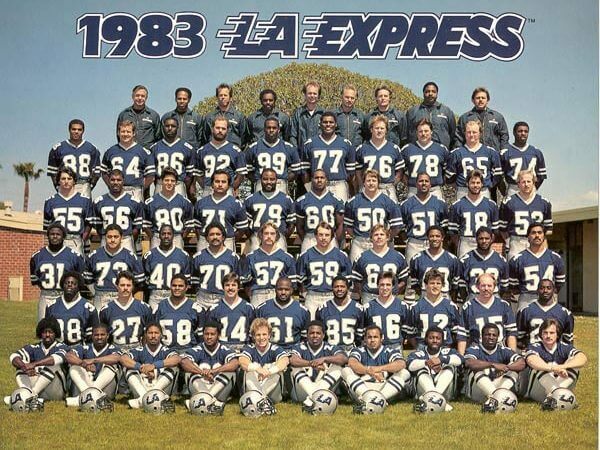 Unable to find a new owner for the Express, the league announced the team would suspend operations for the 1986 season. However, many of the very issues that plagued the Express in 1985 made it very likely the team would not have returned even if the league had succeeded in winning a large payoff from the NFL to finance a move to the fall. Additionally, the Express would have had to compete against two NFL teams and, if they had returned to the Coliseum, would have had to share their home with one of them (the Raiders) and the University of Southern California’s team. The Memphis Express is a professional American football team based in Memphis, Tennessee and a charter team of the Alliance of American Football. The Express were the 3rd of 8 teams announced for the new league, which is set to play in February 2019. Express – The city of Memphis has become one of the nation’s leading centers for transportation and logistics. Here, things move swiftly and purposefully with the goal of achieving awesome results and constantly raising the bar to new heights. The Memphis Express will be no different. The Memphis Express is a professional American football team based in Memphis, Tennessee and a charter team of the Alliance of American Football.